For the second year, Bowen Island mother and son Realtors® Dee and Frazer Elliott have released a year-end sales summary. It was posted to their Facebook page back in January. 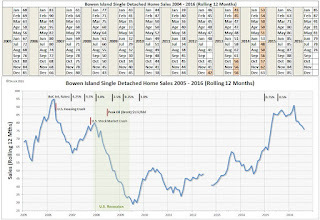 The images below were taken from that summary with the chart on the left showing 2015 home and lot sales month-to-month and the chart on the right showing total sales year-to-year going back to 2007. 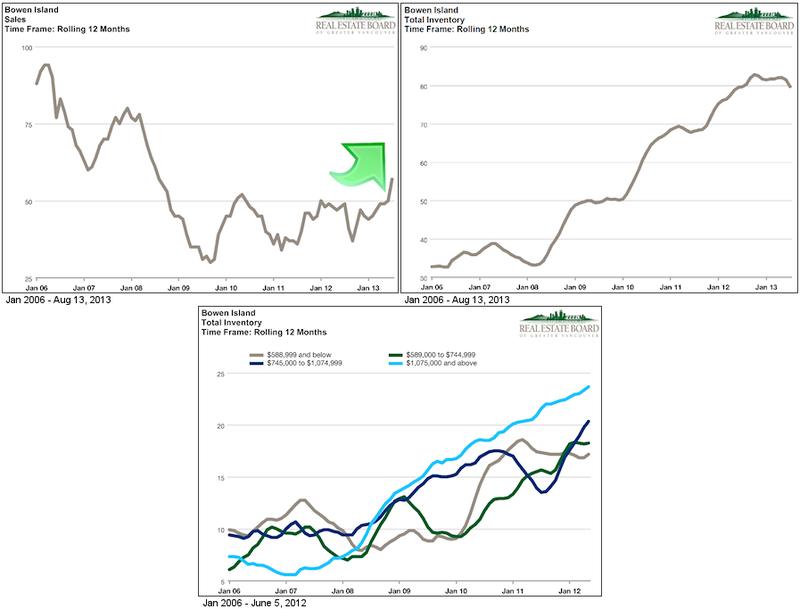 I prepared the tables below using the Elliott summary (sales numbers and average prices) and the REBGV’s monthly benchmark price data. The Elliott total detached sales figure shows an increase of +53.3% compared to 2014 (92 sales vs 60 sales) and the averaged benchmark price rose +6.2% ($614,917 vs $579,225). There were 20 total lot sales in 2015 - an increase of +42.9% over 2014. The Elliott average sales price figures are deceptive in a market this small where 2015 home sales ranged from $221,500 up to and including $2,212,500 and bare lot sales went from $101,000 to $3,480,000. The Elliotts admit this when they write that if you removed the highest lot sale from the equation the 2015 bare lot average sale price dropped to $422,000. 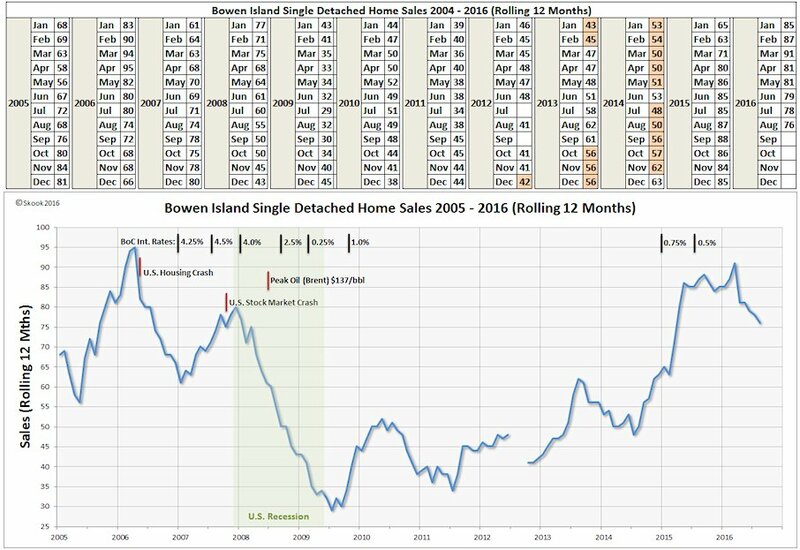 I went back into my own BI files which has home sales data going back to 2004 so I put together my own chart. 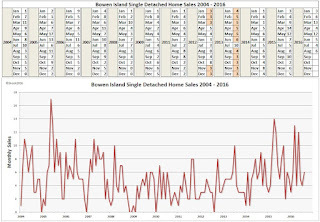 The only year missing was 2013 (I had total sales for the 1st, 2nd, and 3rd quarters but no year-end figure); but, after a google search, I managed to get that total via a February 12, 2014 Bowen Island Undercurrent piece, “Home sales increase, property values keep sinking”. The chart shows the real estate boom of the early 2000s which reached its peak in 2007 (same pattern on the Sunshine Coast) followed by a stunning collapse as the US economy and stock market tanked due to the US housing collapse and subprime mortgage debt fiasco with the latter leading to a world-wide financial crisis; however, as BI house sales tanked the MLS® HPI Benchmark Sales Price continued to rise. It was in 2010 that the sales low and benchmark high met: total house sales – 36, peak benchmark - $625,500 and then the two reversed paths. As sales slowly began to come back, the benchmark sales price began a descent that bottomed out at $555,300 in May, 2013 – that’s almost a two and a half year lag. That lag is a point worth remembering. 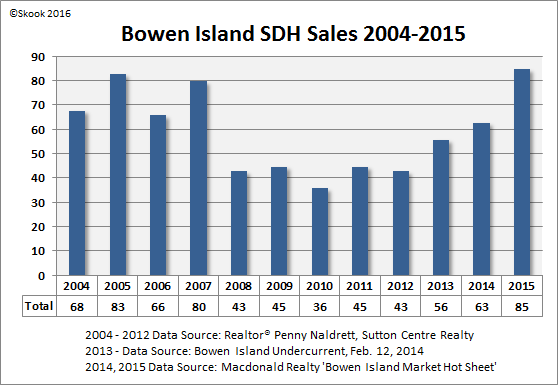 The realtors® quoted in that BI Undercurrent piece above saw 2013 as the turning point for island sales. The primary reason: lower mainlanders influenced by price. Coupled with price was a mindset change with Bowen now “being considered a suburb of Vancouver” in line with Maple Ridge, Abbotsford and even Squamish. I asked myself at this point, “Was there a specific event that caused this movement to the burbs?” and, if so, “How can I chart this?” Well, in my opinion there was an event and the chart already exists. Have you ever visited Brian Ripley’s website? If not, you should because the man’s chart-making ability is amazing. He’s created a Vancouver Housing chart that plots the benchmark sales price, total residential sales listings and sales from 2001 to 2016. I took a portion of that chart and superimposed the BI benchmark chart line so you could see how they progressed in relation to each other. At the beginning of 2012, the Greater Van’s benchmark dramatically spiked, peaked in April and then fell until January 2013. I think this small boom and bust, initiated by change in the HPI benchmark formula, rattled home owners coming so soon on the heels of the 2009 price crunch. Prior to January 1, 2012, the REBGV and FVREB used the MLSLink Housing Price Index – the benchmark sales price system was developed by these two boards. On January 1, 2012, this HPI system expanded to Calgary, Greater Montreal, Toronto and the Canadian Real Estate Board (CREA); in the process, it was renamed the MLS® Home Price Index and the formula for determining the benchmark sales price was recalculated. The Greater Vancouver benchmark sales price jumped from $887,471 in December 2011 to $1,034,720 in January 2012 – essentially an artificially induced overnight increase of +16.6%...oh happy day. As mentioned the benchmark sales price peaked in April 2012 at $1,064,800 – giving a total Dec-Apr increase of 20.0% in the minds of homeowners. Then in May 2012, the boards recalculated the benchmark price again to, in their words, “more accurately reflect trends by the MLS® Home Price Index” and the Greater Vancouver benchmark price fell to $967,500 – a drop of -9.1%. So, was this an admission they had really screwed up in January? The benchmark price continued falling until it reached a low of $901,000 in January 2013 – a total drop of -15.4% (Apr-May). However, if you look at the table on the right below you will notice that the average sale price bottomed out 6 months before and was now on the rise even if a little erratic. So, I think more than a few Greater Van homeowners, especially those retired, decided to cash out and move to cheaper, nearby markets and Bowen Island fit the bill. The table shows BI average and benchmark sale prices were continuing to drop into 2013 with the benchmark bottoming out at $555,300. 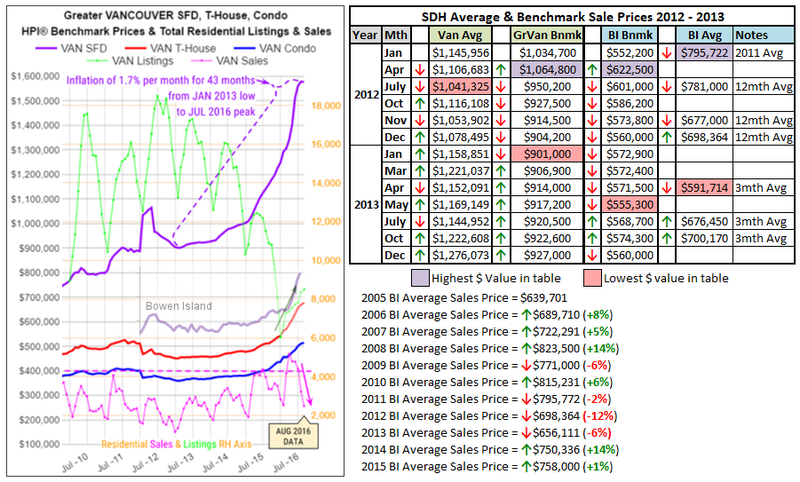 Unfortunately, I can’t give you a total BI benchmark price drop because the REBGV only began separating BI from West Van data beginning January 2012; however, below the table are the yearly BI average home sale prices from 2005 to 2016 and the peak was reached in 2010 at $815,231. Just for fun, taking that average price high and benchmark low gives a total sales price drop of -31.9% - it likely about 6% points lower; either way, at this time there was definite angst amongst home sellers trying to unload. Its little wonder given all of the above BI sales would take off in 2013. The following REBGV charts illustrate the path taken by sales and listing inventory from Jan 2006 to Aug 13, 2013. The bottom chart interestingly breaks down inventory by price range. It should be noted that these are all 12 month rolling data charts. 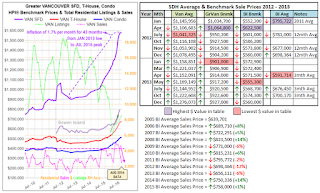 I decided to see for myself how this “rolling 12 month trend” worked so I prepared my own tables and charts beginning with BI’s monthly detached home sales from January 2004 to August 2016. The frenetic chart resulted from plotting those monthly numbers. This is what happens in a very small market where sales go from a low of 0 to a max of 17. However, if you sit back and squint you can see the trends. Next, I calculated the Rolling 12 Month sales figures: Jan 2015 (add sales from Feb 2004 to Jan 2005), Feb 2005 (add sales from Mar 2004 to Feb 2005), Mar 2005 (add sales from Apr 2004 to Mar 2005) and so on up to Aug 2016 (add sales from Sep 2015 to Aug 2016). Now, look what happens when I plot those numbers...dramatic difference, isn’t it? There is no doubt about it if you want to see clear trends this is the chart for you. 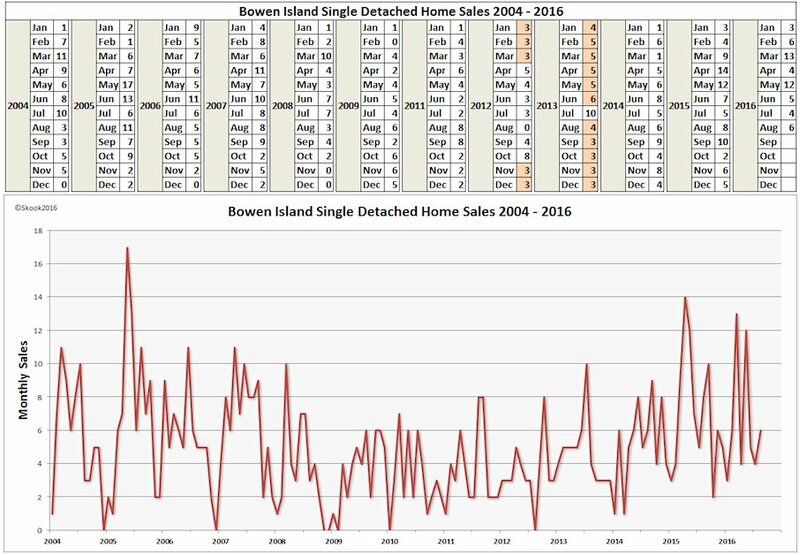 However, if you didn’t know the Bowen market and if the chart wasn’t labelled correctly as “Rolling 12 Months”, you could really misinterpret the volume of sales based on those vertical axis numbers. Good thing we know better. I added some key economic events to the chart that influenced those peaks and troughs in sales (US Housing Crash, US Stock Market Crash, Peak Oil, and the green shaded period of US recession). 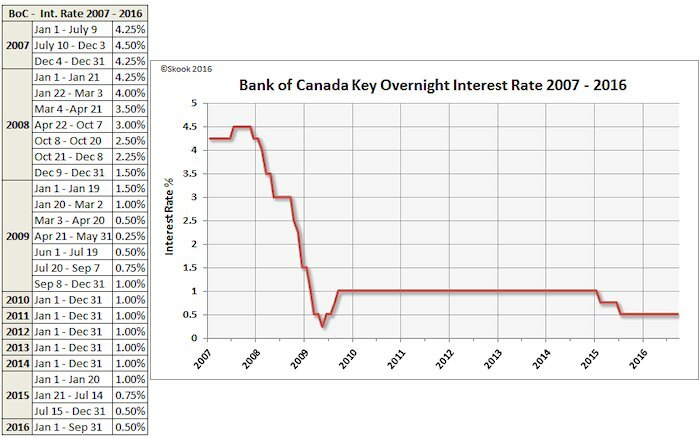 Also, I indicated changes to the Bank of Canada key interest rate which affects both savings (due to interest paid by banks) and variable home mortgage rates (due to interest charged by banks); and, since both are next to nil they’ve played pivotal roles in the current housing bubble. Speaking of interest rates, here’s a table and chart showing the damage that you can keep for easy reference.